Learn About Technology, Computer Tips Tricks, Revenue Models, Business Models, Easily By Cyber World. Xiaomi has launched its latest fitness tracker Mi Band 3 in India. Xiaomi's smart fitness app is an upgraded Mi Band 2 launched in May last year. It comes with the capacitive touchscreen and it is a water resistant up to 5 ATMs. It has a claim of 20 days of battery life in a single charge and it will be available in three colors. In Mi Band 3 you will be able to read text messages. In this, you will get real-time notification of the app. Users will be able to monitor heart rate. Apart from showing time and date, it will also show the distance and calorie figure. Xiaomi Mi Band 3 will be sold in India for Rs.1999. 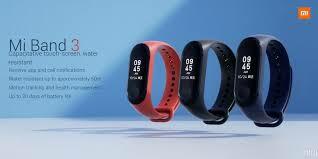 The fitness band will be sold on Amazon India and Mi.com from September 28. The sale will begin at 12 noon. This band will also be available in them at home and other partner offline stores. Xiaomi Mi Band 3 has a large 0.78-inch capacitive OLED display. In the new display, users will be able to see incoming calls and text message alerts, along with the current time, the number of steps and the heart rate. It is 128x80 pixel resolution. The latest I band model has a heart-rate (PPG) sensor. It comes with the triaxial acceleration sensor. There is also a facility for sleep monitoring. Apart from this, the battery is of 110 MAH. It comes with Bluetooth 4.2 BLE connectivity. It is a water resistant for 50 meters. There is also a Health Management feature with motion tracking in Shaomai M band 3. It's also water-resistant. It has been claimed that there is nothing to be done about drowning in deep water for about 50 meters. Xiaomi has not said anything about the IP rating Shaomi Mi will work with the band 3 Android 4.4 and above, or devices running iOS 9.0 and above. Xiaomi has also claimed that the pedometer has improved. It has caller ID / Rejects feature. Apart from this, a reminder can also be placed in a place not allowed to sit for long.